I was recently changing structure of one info cube in BW system. I had to remove one infoobject and add other one. For no particular reason I didn’t want to use Remodeling functionality to do that. 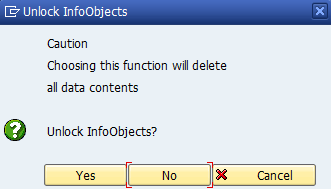 What I did was just I simply put right click on desired IO to be removed and choose Delete option. However nothing happened and my IO stayed in the cube’s structure. I was sure that cube had no data loaded. I also checked aggregates and indexes. None of them existed. I had suspicion that there are still some data left in the cube. But how come as also dimension tables were deleted. Moreover I observed that some of my IOs in the cube’s dimension are blue ones and on other hand some of them are black. Again blue ones were those I suspected having the data. After some examination I found out one option. 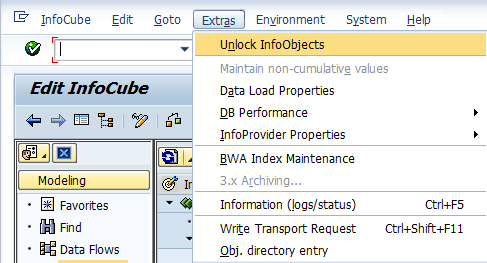 There is a function called Unlock InfoObjects available in TA RSA1 and RSDCUBE. While I went to cube maintenance screen in menu “Extras” there I found this function. What actually this function just did? It released those blue IOs in the cube. Seems it did action kind of deletion cube data also from the IOs which had still same data. After using the function it should be possible to add and/or delete IO from the cube’s structure. To complete this blog post I need to mention that technically function is implemented in class CL_RSD_STRUCT_MAINT and in method SET_GET_IOBJ_LOCD.